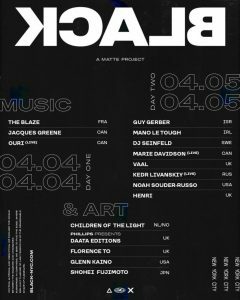 The Blaze will be performing at the opening night of BLACK at Avant Gardner, on April 4th ! The Blaze, since 2015, are Jonathan and Guillaume Alric, two cousins who live in Paris. Their collaborations draw on the warm feel of dub music, but also make use of glittering percussion and mournful vocals. They recently released their first album, on September 2018, Dance Hall. BLACK started out as an expression of an aesthetic. Since it’s inception in 2013, BLACK unifies music, design and contemporary art – transforming a space into an orchestration of form, sound and culture. The palette was minimal (black and white) and it was about celebrating underground NY culture and it’s irreverence and rawness, through music and art. More than an event, it is a moment that stands out from the blur of nightlife and makes you feel some type of way. It is different, in finding the edge between an art event and an adventure into an electronic music world on the fringe of urban desolation.